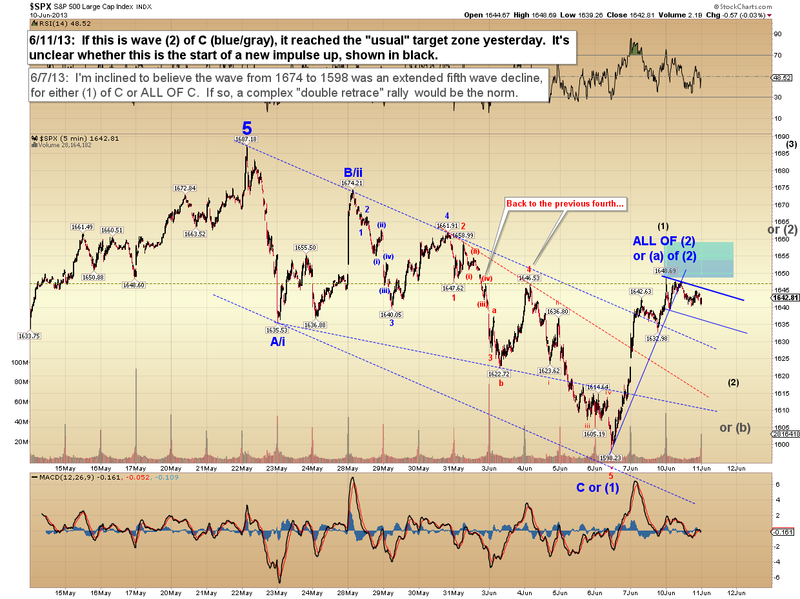 ...fourth waves rarely follow the "most obvious" pattern. They usually turn infinitely frustrating at some point, and become all but impossible to predict. 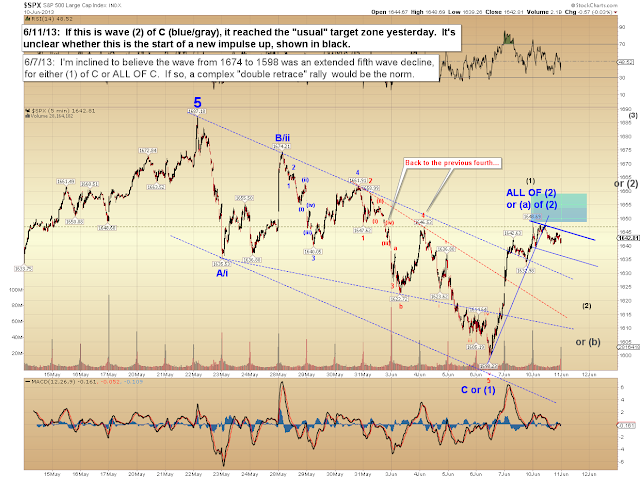 If this is a fourth wave at minor degree, it will probably get ugly and confusing at some point, and leave bulls and bears alike scratching their heads trying to figure out what the market's going to do next. The market tends to alternate between trending waves and cycling waves, and fourth wave corrections in a bull move usually cycle in a sideways-down fashion. They trend near-term, but then stop and grind around just when you think they're going somewhere, chewing up accounts and driving all but the nimblest traders nuts. From my perspective, we haven't reached that point just yet, so enjoy the clarity while it lasts. I've had a great run since May 6, when I switched footing and set my S&P 500 (SPX) targets at 1640-50 and 1680-90 -- then adjusted on the fly and called the 1680-90 zone "almost a given," for a total of about 70 points of captured upside. From there, I hit the turn off the big reaction rally on May 28 and captured 40+ points of downside into the first target zone of 1620-29; then hit the next turn at 1647 for another 40 points into the second target of 1600-1614. That's about 150 points of profit in a (supposed) "buy and hold" market which, as of yesterday, closed only 28 points higher than it was on May 6 when this run started. Since I simply can't see a way to top the performance of the past 30+ days, I was thinking maybe I should go out on a high note, and retire to Maui immediately. Then I remembered: Wait a minute, I already live on Maui! So instead, I considered retiring to some dank inner-city apartment with noisy plumbing in a high-crime area. That didn't sound appealing at all, though... so in the end I decided I'd keep trading and writing updates. I'll have to put off my dreams for another day! And I'd better, because as of right this minute: I don't know. 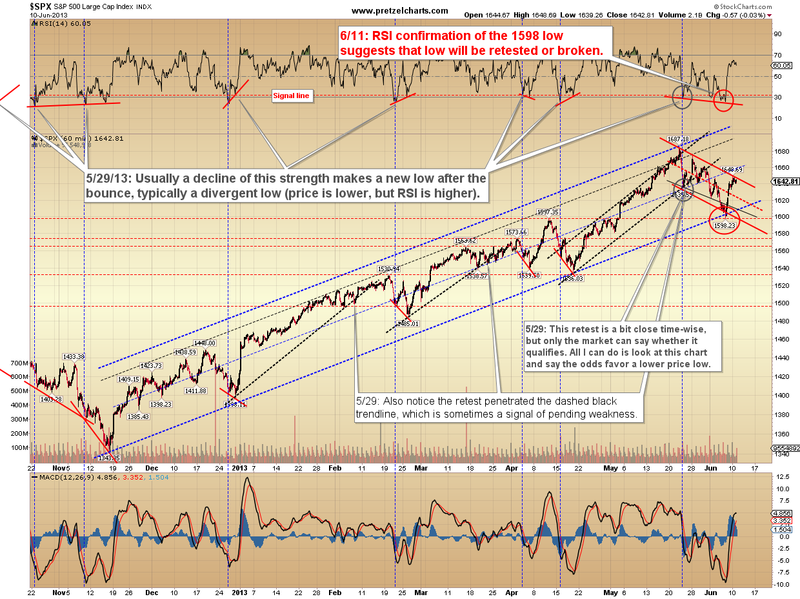 I've been staring at charts a lot over the last few days, and they haven't gotten much clearer. 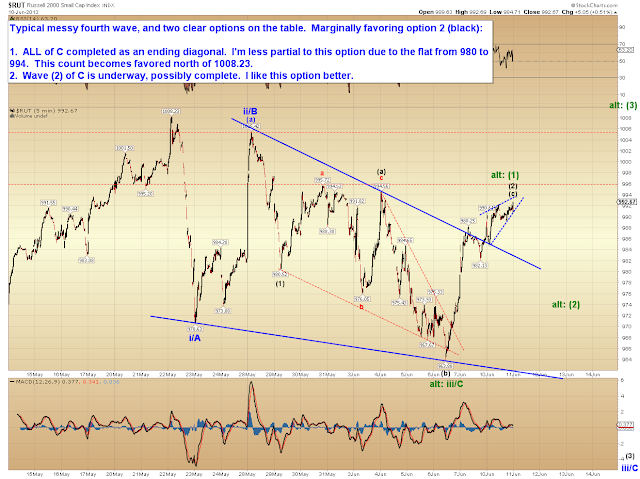 The S&P 500 has all the required ingredients for a completed fourth wave, but I'm more inclined to believe it's incomplete. 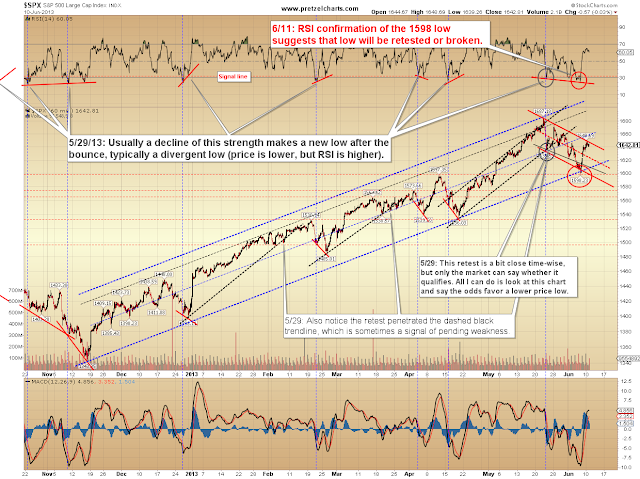 Bulls must hold the 1598 low, since trade beneath that level would suggest a strong third wave decline. 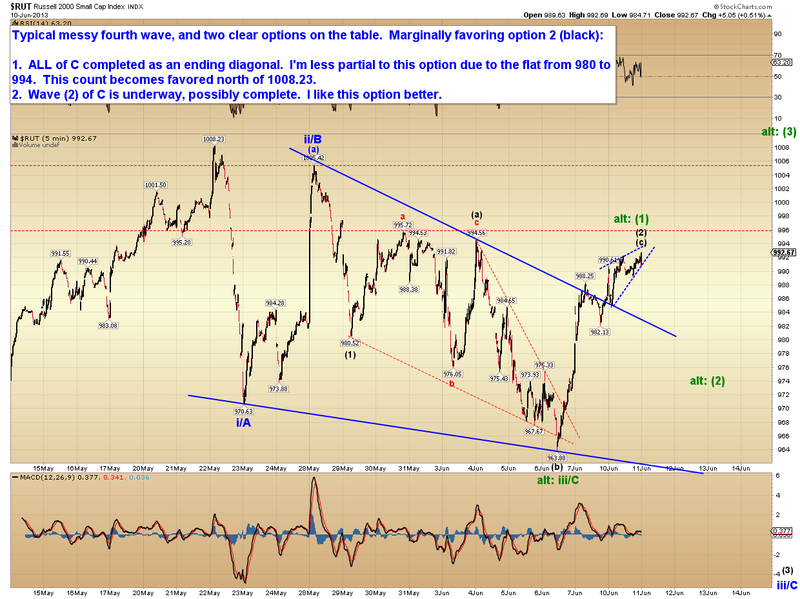 The Russell 2000 (RUT) is also leaning me toward the idea that the final low isn't in yet. The pattern here is hard to count as complete, because there are some very slight subtleties which are just a little bit off (not unlike myself). Again, it falls into the "too close to call" range. 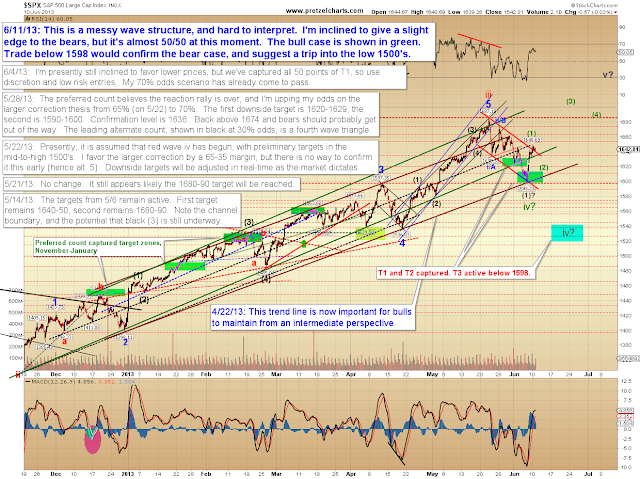 In conclusion, it is technically possible that 1598 marks ALL OF wave C of iv, meaning the market would hold that low and proceed to new highs rather directly -- but I feel there are slightly better odds that the correction lower is still unfolding. We'll keep an eye on things going forward, and hopefully the next few sessions will offer additional clarity. Trade safe. There is no competition, no products to stock, ship or transport.